Following the very busy month of October, I have had a couple of quite relaxing days, catching up on gardening. It’s seen Maureen and I enjoying a walk along the promenade viewing the wonderful vista of the Lakeland mountains and the tranquillity of a calm Irish Sea, ebbing twice a day in and out of Morecambe Bay. The weather has been very kind to us and we have enjoyed some wonderful autumnal days. A very enlightening talk by Geraldene Greenhalgh. On Saturday 3 November, Maureen and I travelled to Preston where we enjoyed a lunch with some of our friends from Morecambe. We booked into our hotel and spent a couple of hours shopping before changing and making our way to Saul Street, the Masonic hall in Preston. This evening we were to enjoy the delights of dinner and entertainment on the occasion of the annual ‘Charity Stewards Dinner’ in support of the MCF 2021 Festival. Some 140 brethren and their ladies enjoyed a delicious meal followed by great entertainment from ‘The Chuckletruck` a four-piece, family affair, band who gave us humour and music to dance the night away. The raffle and the auction raised a tremendous amount of money for the Festival and I was presented with a cheque for £2,021. Thank you to all who arranged the event and to all who so kindly supported it. The next day, after a good night`s sleep and a hearty breakfast we set off home via Garstang and called at the Barton Grange Garden Centre, which was packed with visitors viewing the Christmas lights and decorations. What a wonderful sight. On the Monday I caught up with some more paper work in the morning and then late afternoon Maureen and I, together with Keith and Beryl Kemp, travelled to Barrow in Furness and the Fairfield Masonic Centre. We were visiting for the meeting of Lonsdale Lodge of Installed Masters who were having a talk delivered by Geraldene Greenhalgh on the `Order of Women Freemasons. ` The meeting was enjoyed by some 85 brethren and their ladies and I believe that we all made our daily advancement with the knowledge imparted to us. Following this very enlightening talk we enjoyed the delights of dinner and friendship before returning around the bay to Morecambe. On 6 November, I travelled to Liverpool with David Grainger, Peter Schofield and Graham Halsall for a meeting of Jacques de Molay Preceptory, meeting at Hope Street. It has been quite some time since I have had the opportunity to attend my Knights Templar Order and I had a thoroughly enjoyable and very relaxed meeting. Congratulations to Andrew Jones of Yachtman`s Lodge. The next day I was off to Woolton Golf Club that afternoon with Keith Kemp. No, not playing golf but attending the installation meeting of Yachtman`s Lodge No 3698. We received a warm welcome and a cup of tea and a biscuit upon our arrival, from Tommy. What a lovely welcome. I entered into a full lodge room and then we all witnessed an excellent installation ceremony. Andrew Jones was installed by his father Len Jones with assistance from other past masters of the lodge. I was delighted receive a wonderful donation to the 2021 Festival. Following the ceremony, we adjourned to the bar for pre-dinner dinks and then onto the dinner in the dining room where the walls are clad with past Captains of the golf club. One or two familiar faces in this gallery even though they were younger men at the time. A great evening was had by us all. Thursday 8 November and first thing that morning I was off to Leyland for the AGM of the WLFC. Despite much advertising for this meeting it was not well attended by members of the Province. We were all brought up to date on the present status of our charity by the chairman Mark Mathews and the CEO Stephen Kayne and then we had two most interesting talks, firstly on the Blood Bikes which we donated and secondly from ‘Lifelites’, a charity which we supported this year. These were very well received by all who were present. On the Friday afternoon Maureen and I travelled to Grange over Sands. We were staying at the Cumbria Grand Hotel for the weekend. After checking into the hotel, I was picked up by Keith Kemp and we travelled into Grange, heading for the Masonic hall where we made a surprise visit to Arthur John Brogdan Lodge No 1715. It was their business meeting, but John Martin gave a most interesting talk on the history of the early years of the lodge. What a great night we had which included a meat and potato pie with mushy peas and pickles followed by cheese and biscuits. The brethren were well and truly surprised to see us. The next morning, after a hearty breakfast Maureen and I, together with many other friends set off for a long, brisk walk along the Grange promenade. It was strange viewing Morecambe from this side of the bay as the tide was coming in. I must say I think that the bay looks better from Morecambe with the Lakeland hills as the back drop. 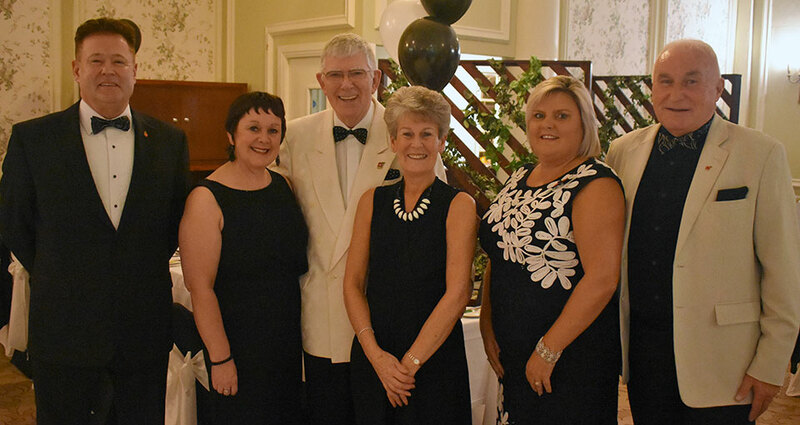 This evening we attended the Furness and South Lakeland Group ‘Black & White Ball’ in support of the 2021 Festival. What a wonderful evening we all enjoyed! After dinner we watched a marvellous `Firework ` display then danced until midnight. 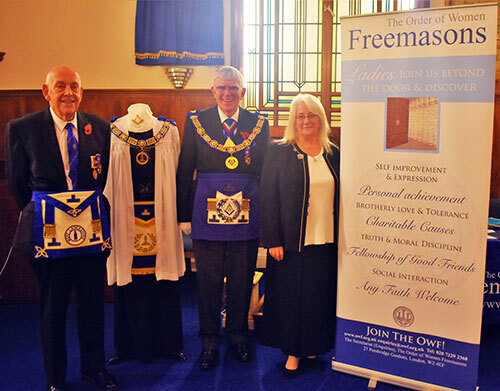 The event, organised by Richard Wilcock, was attended by over 170 brethren and their wives. A fantastic occasion. Maureen and I at the ‘Black & White Charity Ball’ with Michelle and Peter Schofield (left) and Jackie and Richard Wilcock (right). Sunday 11 November dawned and after yet another hearty breakfast we travelled back to Morecambe. Just time to unpack and change and then Maureen and I were off to Brookfield Masonic Hall, Westhoughton with Keith and Beryl Kemp. We attended an ‘Evening of Remembrance’, commemorating the 100th anniversary of Armistice Day. This special evening had been organised by Gary Smith and was attended by over 100 brethren and their wives. We received three extremely moving presentations on the Great War and learned of those brethren from the group who made the ultimate sacrifice for their country. Following these moving revelations, we enjoyed a meal similar in many respects to one which might have been enjoyed over 100 years ago. 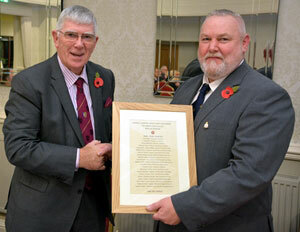 Receiving a copy of the ‘Roll of Honour’ from Gary Smith. It consisted of; vegetable soup, potatoes, corned beef and onion pie with beetroot, cabbage, and carrot and swede mash. This was followed by apricot bread and butter pudding. I am sure that our dinner was tastier than it would have been back then! On our return journey to Morecambe it was unfortunate that the M6 was closed at Preston and all traffic had to travel through the city. On the Monday I travelled back to Furness and South Lakeland in the afternoon for the installation meeting of Newby Bridge Lodge No 4598. The meeting was in their own Masonic hall which is just at the rear of the Newby Bridge Hotel. A delightful little Masonic centre. The lodge room was full as I entered, and I was greeted by all present. We witnessed an excellent ceremony conducted by Phil Preston who installed Mark Little. I was thrilled to have received a magnificent donation to the 2021 Festival from the lodge. 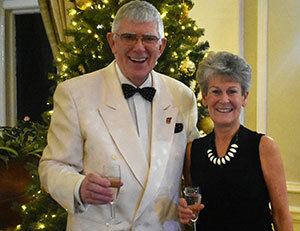 We then retired to the hotel for pre- dinner drinks and a really enjoyable banquet to conclude a fantastic occasion. Congratulating Robert Wilson of Warrington Lodge of Concord. The next day I travelled to Warrington with Keith Kemp for the installation meeting of Warrington Lodge of Concord No 1250. Upon arrival I was offered a most refreshing cup of tea and a warm welcome from the many brethren present. I took the opportunity to revisit the Warrington Masonic Museum once again and to see the many new features that had been added since my last visit. I entered a full lodge room and was delighted to witness Robert Wilson being installed by his father, who is a Mason from the Province of Derbyshire. What a wonderful occasion and following the meeting we retired to the dining room for drinks, dinner and the odd speech here and there. A very enjoyable evening to be long remembered. Wednesday 14 Nov saw me catching up with some paperwork that morning, but after lunch Keith Kemp and I travelled to Saul Street, Preston for the installation meeting of Fraternity Lodge No 4072. Chris Butterfield one of my Assistants in the Royal Arch, was installed as master. The ceremony was conducted by Russ Procter and he did a great job. It really was a super ceremony, followed by a most enjoyable festive dinner. I was accompanied on this evening by David Winder together with the group chairman Stephen Bolton, and his group officers. Sadly, I had to miss the annual Provincial meeting of the Province of East Lancashire the next day, due to unforeseen circumstances. At the end of that week, I attended a morning meeting with my colleague PGM`s from North Wales, Isle of Man, Cheshire and East Lancashire for our annual meeting and get together. On this occasion we met at Christleton Masonic Centre in Cheshire. Maureen and I were now able to enjoy a very relaxing weekend, tidying up the garden from the fall of autumn leaves and enjoying the wonderful walks along our beautiful promenade in the autumn sunshine, viewing the Lakeland hills. At the start of the next week, I travelled to Adelaide Street, Blackpool, for the installation convocation of Bispham with Norbreck Chapter No 4731. A warm welcome and a delightful cup of tea were offered on my arrival. I was accompanied by my Deputy Grand Superintendent Paul Renton and my Royal Arch Assistant Duncan Smith together the local group chairman John Turpin. There was a good attendance of companions and we witnessed an excellent installation ceremony. I was amazed at the acting DC Alan Law who having retired from office several years ago was able to undertake those duties so admirably. Following the ceremony, I was introduced to all the companions and their guests prior to our festive board. Sadly, a fantastic evening came to a close all too soon and I had to leave for my homeward journey. 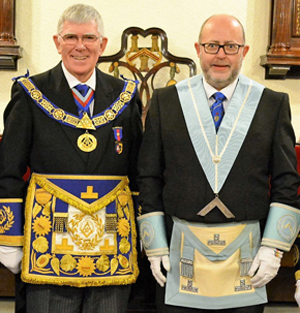 Wednesday 21 November heralded the installation meeting of Adoniram Mark Lodge at Leyland. The meeting was well attended, and John Bicknall installed his successor Jim Mylan in an exemplary manner. Well done to all who took part. This week came to a close as I attended Derby Street in Morecambe on the Friday evening for my Rose Croix meeting. Very relaxing and nice to meet with many of my local companions for an excellent ceremony shared by several members of the chapter. The final week of the month began with a frosty start to the morning, but the sun soon shone out and we enjoyed a wonderful winter`s day. I was off to Poulton le Fylde that afternoon with Keith Kemp as we were attending the installation ceremony of Foxhall Lodge No 7484. A lovely Masonic centre tucked away in the centre of the village. We received a wonderful warm welcome and enjoyed the company of some 60 brethren. They had joined us to witness what was an excellent ceremony, worked by Derek Lewthwaite, who installed John Alpin who had been a member of the Lodge for only five years. Following the ceremony, I received donations for many local charities which also included WLFC and the MCF 2021 Festival. Grateful thanks to all the brethren for their hard work in supporting these charities. We enjoyed a great dinner and following the speeches it was time to depart for our homeward journey back to Morecambe after enjoying yet another Masonic feast. The next day I awoke to yet another wonderful winter`s morning with a cold frost but bright sunshine. I was ready for undertaking some paperwork and then off to St. Helens that afternoon. Picking Keith Kemp up on the way, we soon saw a dramatic change in the weather with high winds and torrential rain. This threatened to hamper our journey to the Masonic hall for the installation meeting of Ionic Lodge No 2405. However, a great warm welcome and a cup of tea upon arrival was followed by an opportunity to meet with many of the brethren and their guests prior to the ceremony. Some 60 brethren met in the lodge room. George Irving was installed by Paul Black and we all witnessed a first-class ceremony after which we adjourned for pre-dinner drinks. Wishing you all a Merry Christmas and a healthy, peaceful and happy New Year from both of us. We then went upstairs for the festival dinner prepared by Peter, the chef and what a great meal we enjoyed. Regrettably the evening came to an end and we had to travel home but thankfully the wind had subsided and rain ceased so the homeward journey was much more pleasant. The penultimate day of November and despite the terrible torrential rains and strong winds, I set out for Gosforth Park Race Course. No, I was not going off on a betting spree. I was attending the annual Provincial meeting for the Province of Northumberland. I was accompanied by Phil Gunning, Frank Umbers, Peter Taylor and we were driven by Geoffrey Lucas. Not a very pleasant journey up the M6 and across the A69 to Newcastle, but we arrived in the sunshine. A most enjoyable meeting attended by almost 500 bethren and guests of the province. 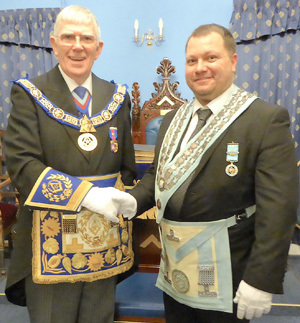 Ian Craigs presided over the meeting and invested 168 brethren. We also received an update on the MCF – RIBI Festival by Co-ordinator Paul Crockett from the Masonic Province of Surrey who gave an excellent presentation. Following the meeting we enjoyed pre-dinner drinks and an opportunity to meet with the guests from other Provinces before enjoying a great dinner of traditional Northumberland lamb. Sadly, it was soon time to depart for our long journey home, arriving back rather later after a long but very enjoyable day. My visit to Northumberland brought my Masonic duties to a close for the month. Although once again very busy, it’s been wonderful meeting with so many brethren and companions and at the same time enjoying Freemasonry at its best. May Maureen and I take this opportunity to wish you and all your families a very Merry Christmas and a happy, healthy and prosperous New Year.